» Pure Green Coffee Bean Extract Reviews: Does It Really Help In Weight Loss? Since 2012, the popularity of using green coffee bean extract to help promote faster weight loss has grown exponentially. Today, you can find its weight loss products being endorsed by fitness experts and celebrities alike. But is pure green coffee bean extract really as effective as others have claimed? By the end of this review, you should have a clear disposition of your stance on the benefits of pure green coffee bean extract. The straightforward answer to this question couldn’t be simpler. Green coffee beans are the unroasted version of the coffee people drink every day. They are derived from the coffee plant and are grown and harvested in all corners of the world – Brazil, Vietnam, India, Peru, and in some other countries. ​But there’s more to the green coffee bean than what meets the eye. Recent studies have backed claims that the green coffee bean possesses properties that promote weight loss and provide several health-related benefits. Many of these studies attribute green coffee beans’ powers to an all-star combination of minerals and vitamins, with two major players leading the way. In addition to caffeine, pure green coffee beans are loaded with antioxidants and other components that influence the human body in a variety of different ways. ​However, there is one key ingredient found in green coffee beans that is almost completely removed from the bean during the roasting process. Here Are 15 Juicing Recipes You need to know For Healthy Living and Weight Loss. As a result of the absence of chlorogenic acid in roasted coffee and the overwhelming bitterness of drinking unroasted green coffee beans, companies now extract the chlorogenic acid from the beans and offer it to consumers in the form of a weight-loss based dietary supplement. 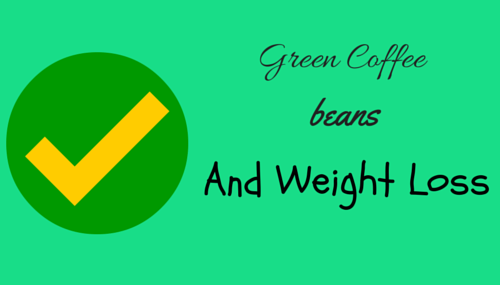 How Green Coffee Bean is Effective for Weight Loss! It’s this claim of the green coffee bean’s weight loss capabilities that has pure green coffee bean extracts flying off of the shelves of local pharmacies and nutritional supplement providers. ​But why are green coffee bean extracts so effective at promoting weight loss? Chlorogenic acid is a cinnamic acid derivative that contains several different antioxidants and anti-inflammatory activities that provide a couple of significant weight-loss benefits. Certain components of chlorogenic acid have been found by researchers to aid in the reduction of carbohydrate absorption in humans(1). What this means is that your body will not burn through as many carbs – your body’s first source of stored energy – throughout the day. Other studies have found that certain components present in chlorogenic acid could potentially improve the overall functionality of a fat-burning hormone called adiponectin (2). Caffeine is unquestionably the most popular ingredient in everyday coffee. The general opinion of caffeine and its effects on the body used to be more negative than positive. Caffeine jump starts the process of lipolysis – your body’s natural ability to release free fatty acids into your bloodstream(3). It’s no secret that caffeine is a stimulant that temporarily increases energy and alertness while simultaneously decreasing drowsiness. ​As such, caffeine can give you that extra boost needed to give it yours all during a workout and other physically demanding activities. Some studies have indicated that caffeine may actually help temporarily suppress a person’s appetite(4). However, there is not yet enough conclusive research to fully back this claim. What Are Green Coffee Bean Extract Side Effects? There have been claims that pure green coffee bean extracts have no side effects. That statement is completely false. Green coffee beans naturally contain caffeine, which has been proven to produce side effects when consumed in large quantities or by people especially sensitive to caffeine. Once again, caffeine is a stimulant. This means that when consumed in large quantities or by people sensitive to caffeine, green coffee bean extract could potentially cause increased anxiety or depression. Both caffeine and chlorogenic acid contain diuretic properties. More often than not, this results in increased urine output. However, in some instances, it can result in diarrhea. Some people are either mildly or severely allergic to caffeine. If that’s the case, then the absolute best thing you can do is to seek medical attention as soon as possible and refrain from further consumption of green coffee bean extract. ** Important: As of this writing, green coffee bean extract has not been proven to be safe for pregnant or breastfeeding women. So it is strongly recommended that you do not take this supplement if you currently fall into either category. Most of the potential side effects associated with pure green coffee bean extract can be avoided by avoiding over consumption. It really is that simple. Follow the recommended daily dosage. Each bottle of green coffee bean extract comes with its own directions. Don’t deviate from those directions. Most brands will offer a daily dosage ranging from 150-300mg. Some brands will recommend up to 400mg, which is still considered safe. Cut the dosage in half. If the recommended daily dosage gives you too many side effects, consider cutting the dosage in half and either taking a half dosage once daily or a half dosage twice daily. If you do take it twice daily, make sure your second dosage is not taken right before bed. The research and studies on the effects of pure green coffee beans in relation to weight loss are still in their infancy; however, a majority of the information that has been gathered thus far supports the claims that green coffee beans promote improved weight loss. Previous Post The Eight Best Dumbbell workouts for Women Next Post What Is Glutathione and How Is It Good For Your Health?